The military has used Infrared night vision equipment since it could be done, maybe WW1 and for sure WW2. 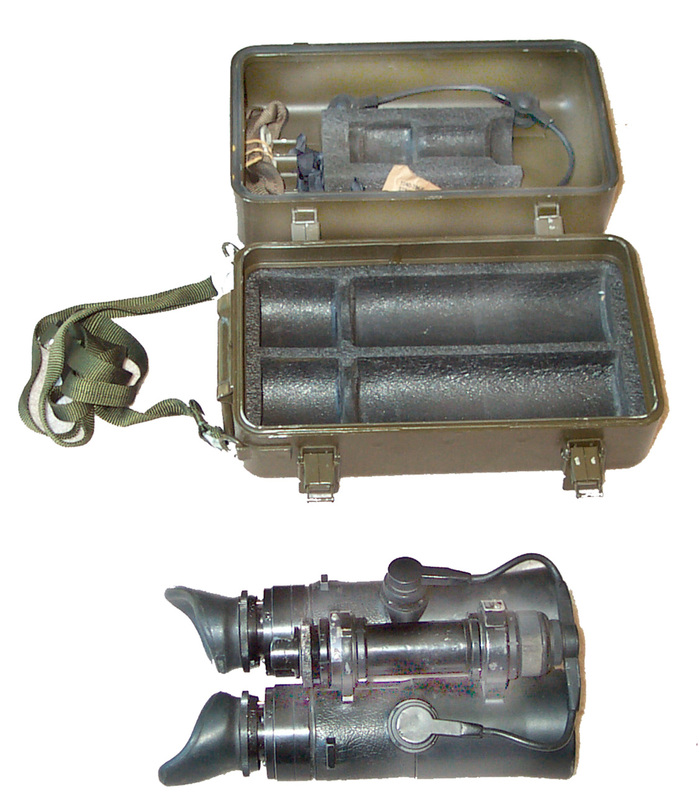 In the 1960's there were a large number of "sniper scope" IR devices and tubes offered on the surplus market. In the 1990's and 2000's there are a number of M18 IR binoculars on the market. Most military IR night vision equipment operates in what's called near IR. This means the wavelength is just a little longer than visible red light and is not visible to the unaided eye. To use near IR equipment you need some type of IR light source that typically is a visible light source with an IR filter. The Xenon lights on armored tanks are an example. This is not a far IR viewer that can see things like body and engine heat. Far IR viewers are typically monocular and cost in the thousands of dollars as used equipment and tens of thousands of dollars new. Unlike image intensifiers that will be burned by use in daylight, you can use the M18 in daylight, but it's performance is poorer than ordinary binoculars. This is an easy way to test them. Following is an overview of how the M18 was used in Vietnam from someone that was there. The Army sent four searchlight batteries to Vietnam, and the Marine Corps had one. All were equipped with 23-inch Xenon searchlights, the same searchlight that was mounted on the M-60 tank. Ours were mounted on jeeps but frequently used other configurations -- on towers, on ships, etc. The light was capable of a spread beam or a focused beam, using white light or infrared light. The IR light was made by mechanically rotating an infrared filter around the Xenon bulb. The IR was invisible to the naked eye, but each searchlight section was equipped with an IR monocular, called a metascope, and one M-18 binocular. The IR searchlight would illuminate the area several hundred meters to its front, and by watching through the M-18s the operator could see reflected IR, with everything looking sort of green but warmer objects, especially humans, appearing much brighter green (the fact that humans tend to move also helped in their detection). The searchlights were often paired with anti-aircraft automatic weapons, specifically twin 40-mm "pom-pom" guns called Dusters and quad-mounted .50-caliber machine guns called Quads. When a target was identified, the M-18s were passed to the weapon operator so he could point his guns in the general direction, then on cue the searchlight operator would rotate the IR filter out of the way and illuminate the target with white light. In sum, the searchlight was an IR light source, and the metascope and M-18s were light receivers. My platoon supported the US 9th Infantry Division in the Mekong Delta, and about halfway through my tour I was called to the assistant division commander's office to take possession of six "Pink Filters." These were essentially identical to the IR filters, except that they emitted a slightly different wavelength. They were optimized for use with the first generation of light-amplification night vision devices, the Starlight Scope and Night Observation Device. The light they put out was still invisible to the naked eye, but could be seen through those devices. We worked with snipers quite a bit, extending the range of what they could see and hit, and providing an area search capability that they lacked. As I recall, the "pink light" could still be seen through the M-18 binoculars, but the images were not as clear as through a Starlight Scope. The M-18s were expensive -- for some reason the figure $10,000 a pair sticks in my mind. They also were capable of producing quite an electric shock. Install a BA-42 ("C" cell) into the battery compartment by unscrewing the end of the battery compartment. Note that the cap holds the ON-OFF switch. The battery goes in negative end first, positive end toward switch. The pair that I have has some green fuzz when looking up at the night sky. The field of view is not totally black. Putting Aluminum foil over the objectives with a rubber band shows the left tube to have the green "fuzz" and the right tube to be much more black. I'll try at night when my eyes are night adapted. Theoretically you should be able to see satellites in near IR because the Sun is illuminating them. 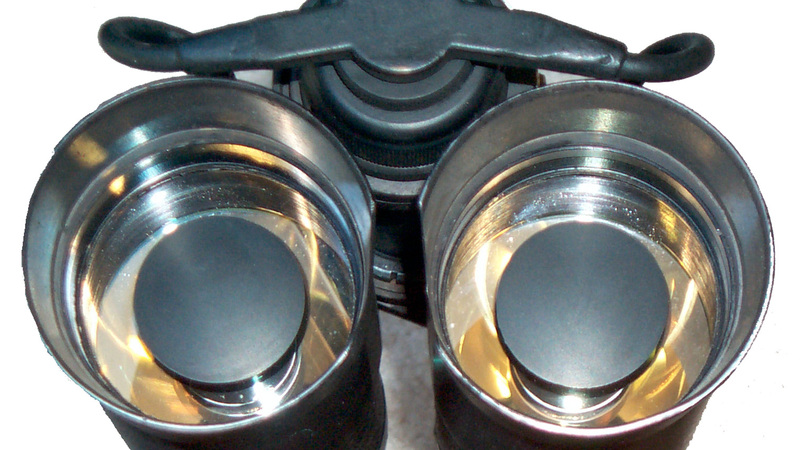 The question is how does this compare to ordinary night time binoculars and image intensifiers for satellite viewing. 7 Aug 2002 - a power failure just at dusk was a good excuse to utilize a lawn chair to have an IR look upward. It's now clear that the IR binocs show planets but not stars. There were 4 planets out just after sunset (I'm at 39N 123 W). I have since learned that these must have been IR stars since there was only one planet visible at that time. No satellites were seen, but I'm now quite sure they will be visible in the IR binocs. Maybe people imaging space objects should pay attention to IR focus. These binoculars can see IR Beacons although I think the beacons were designed for use with Night Vision Image Intensifier type equipment. They can also see IR remote controls. The SDU-5/E emergency strobe light with the IR cap installed appears to have a bright flash in the M18 but looks dead to your eye. This is true even if the SDU-5/E is in the cloth pouch. Like in the movie "Blackhawk Down". Because of the double mirror design when viewing an IR LED at close range it appears as a donut not a circle. page created 19 July 2002.